DIE Mercurii, 1 die Martii. Additional Bill for better collecting the Excise. Bill to take away Damage Clear. and for a Conference on the E. of Thanet's Bill, &c.
and that the Lords agree to the following Bills. Report of the Conference on the E. of Thanet's Bill. and concerning a Message to the King, for a General Fast, for the Success of the Fleet. Committee to attend the King, with an Address for a Fast. Message to H. C. to appoint a Committee to join with them. Message from H. C. with the Bill to repeal Part of an Act concerning Prize Goods. Bill to prevent Arrests of Judgements. Bill to prevent Delays in extending Statutes, &c.
Comes & al. Nat. Bill. E. Suffolk, Privilege. Banson discharged. D. of York, Privilege. Gilbert, &c. released. DIE Mercurii, primo die Martii, post meridiem. Bill for Relief of Prisoners. 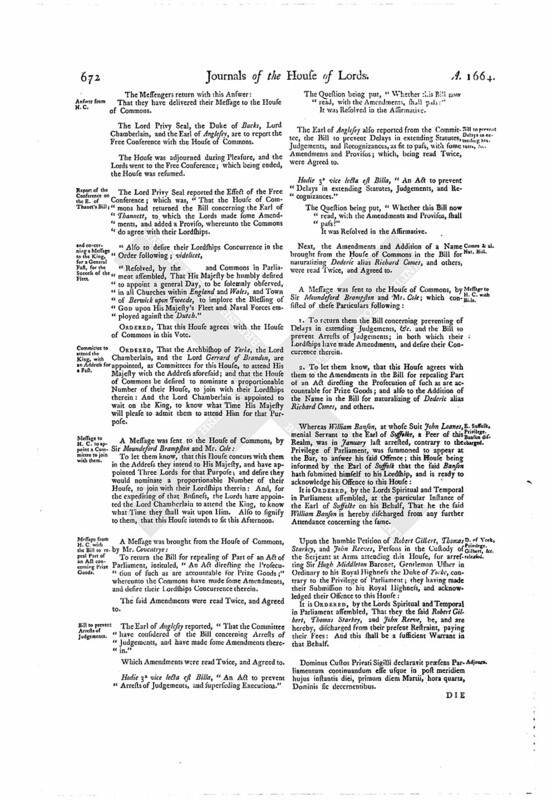 Bill for uniting Churches in Cities, &c.
Message from thence, with Sir C. Stanley's Bill. Message from thence, for a Conference on the Bill to prevent Delays in extending Statutes, &c.
Message to H. C. about Ld. Hunsdon's Proviso in the Bill to prevent Delays in extending Statutes, &c.
Epus. Petriburgh. Ds. Custos Privati Sigilli. Viscount de Stafford. Ds. Delawar. The Earl of Bolingbrooke reported, "That the Committee have considered of the Bill for the better ordering and collecting of the Duty of Excise; and think it fit to pass as it is." Hodie 3a vice lecta est Billa, "An Act for the better ordering and collecting the Duty of Excise." The Lord Viscount Say & Seale reported, "That the Committee have considered of the Bill for taking away Damage Clear, and have made some Alterations therein:" Which were read Twice, and ordered to be re-committed. The Earl of Bolingbrooke reported, "That the Committee for the Bill concerning the restoring of Sir Charles Stanley in Blood have made some Amendments therein;" which, being read Twice, were Agreed to. Hodie 3a vice lecta est Billa, "An Act for restoring Sir Charles Stanley in Blood." The Question being put, "Whether this Bill, with the Amendments now read, shall pass?" A Message was brought from the House of Commons, by Sir Thomas Higgins and others; who returned the Bill for naturalizing Dederic alias Richard Comes, and others, which their Lordships sent down with some Amendments and a Proviso; to which the Commons do agree, and have added another Name, to which they desire their Lordships Concurrence. Also he said, "That the House of Commons desire a Free Conference, concerning the Earl of Thannett's Bill, and concerning a Message which they intend to send to the King." That the Lords, in Answer of a Message received from the House of Commons, have agreed to give that House a Free Conference, by a Committee of both Houses, upon the Earl of Thannett's Bill; and the Time for that Conference they have appointed to be presently, in the Painted Chamber; at which Time and Place they will also give that House a Conference touching a Message that House intends to send to the King. Likewise to deliver them the Bill which they sent up, for restoring Sir Charles Stanley in Blood; to which the Lords have made some Amendments, and desire their Concurrence thereunto. 1. The Bill for better ordering and collecting the Duty of Excise. 2. The Bill to empower the Chancellor of the Dutchy to grant Commissions to take Affidavits. 3. The Bill for making navigable the River of Medway. 4. 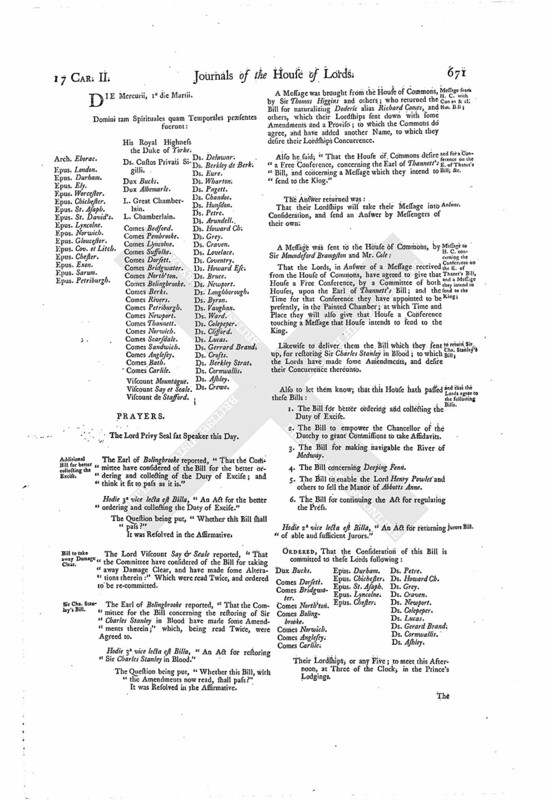 The Bill concerning Deeping Fenn. 5. The Bill to enable the Lord Henry Powlet and others to sell the Manor of Abbotts Anne. 6. The Bill for continuing the Act for regulating the Press. Hodie 2a vice lecta est Billa, "An Act for returning of able and sufficient Jurors." That they have delivered their Message to the House of Commons. The Lord Privy Seal, the Duke of Bucks, Lord Chamberlain, and the Earl of Anglesey, are to report the Free Conference with the House of Commons. The House was adjourned during Pleasure, and the Lords went to the Free Conference; which being ended, the House was resumed. The Lord Privy Seal reported the Effect of the Free Conference; which was, "That the House of Commons had returned the Bill concerning the Earl of Thannett, to which the Lords made some Amendments, and added a Proviso, whereunto the Commons do agree with their Lordships. "Resolved, by the and Commons in Parliament assembled, That His Majesty be humbly desired to appoint a general Day, to be solemnly observed, in all Churches within England and Wales, and Town of Berwick upon Tweede, to implore the Blessing of GOD upon His Majesty's Fleet and Naval Forces employed against the Dutch." 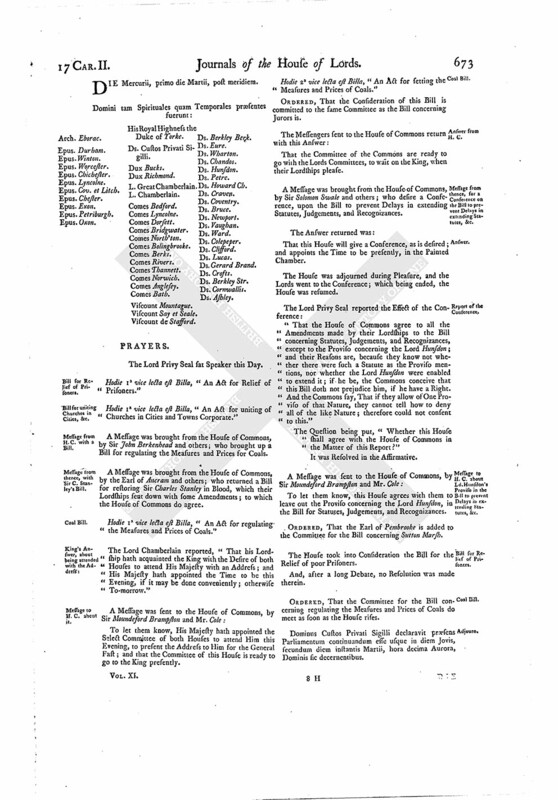 ORDERED, That the Archbishop of Yorke, the Lord Chamberlain, and the Lord Gerrard of Brandon, are appointed, as Committees for this House, to attend His Majesty with the Address aforesaid; and that the House of Commons be desired to nominate a proportionable Number of their House, to join with their Lordships therein: And the Lord Chamberlain is appointed to wait on the King, to know what Time His Majesty will please to admit them to attend Him for that Purpose. To let them know, that this House concurs with them in the Address they intend to His Majesty, and have appointed Three Lords for that Purpose; and desire they would nominate a proportionable Number of their House, to join with their Lordships therein: And, for the expediting of that Business, the Lords have appointed the Lord Chamberlain to attend the King, to know what Time they shall wait upon Him. Also to signify to them, that this House intends to fit this Afternoon. To return the Bill for repealing of Part of an Act of Parliament, intituled, "An Act directing the Prosecution of such as are accountable for Prize Goods;" whereunto the Commons have made some Amendments, and desire their Lordships Concurrence therein. The said Amendments were read Twice, and Agreed to. The Earl of Anglcsey reported, "That the Committee have considered of the Bill concerning Arrests of Judgements, and have made some Amendments therein." Which Amendments were read Twice, and Agreed to. Hodie 3a vice lecta est Billa, "An Act to prevent Arrests of Judgements, and superseding Executions." The Question being put, "Whether this Bill now read, with the Amendments, shall pass?" It was Resolved in the Assirmative. The Earl of Anglesey also reported from the Committee, the Bill to prevent Delays in extending Statutes, Judgements, and Recognizances, as fit to pass, with some Amendments and Provisos; which, being read Twice, were Agreed to. Hodie 3a vice lecta est Billa, "An Act to prevent Delays in extending Statutes, Judgements, and Recognizances." The Question being put, "Whether this Bill now read, with the Amendments and Provisos, shall pass?" Next, the Amendments and Addition of a Name brought from the House of Commons in the Bill for naturalizing Dederic alias Richard Comes, and others, were read Twice, and Agreed to. 1. To return them the Bill concerning preventing of Delays in extending Judgements, &c. and the Bill to prevent Arrests of Judgements; in both which their Lordships have made Amendments, and desire their Concurrence therein. 2. To let them know, that this House agrees with them to the Amendments in the Bill for repealing Part of an Act directing the Prosecution of such as are accountable for Prize Goods; and also to the Addition of the Name in the Bill for naturalizing of Dederic alias Richard Comes, and others. It is ORDERED, by the Lords Spiritual and Temporal in Parliament assembled, at the particular Instance of the Earl of Suffolke on his Behalf, That he the said William Banson is hereby discharged from any further Attendance concerning the same. It is ORDERED, by the Lords Spiritual and Temporal in Parliament assembled, That they the said Robert Gilbert, Thomas Starkey, and John Reeve, be, and are hereby, discharged from their present Restraint, paying their Fees: And this shall be a sufficient Warrant in that Behalf. Dominus Custos Privati Sigilli declaravit præsens Parliamentum continuandum esse usque in post meridiem hujus instantis diei, primum diem Martii, hora quarta, Dominis sic decernentibus. Epus. Oxon. Ds. Custos Privati Sigilli. Viscount de Stafford. Ds. Berkley Berk. Hodie 1a vice lecta est Billa, "An Act for Relief of Prisoners." Hodie 1a vice lecta est Billa, "An Act for uniting of Churches in Cities and Towns Corporate." A Message was brought from the House of Commons, by Sir John Berkenhead and others; who brought up a Bill for regulating the Measures and Prices for Coals. A Message was brought from the House of Commons, by the Earl of Ancram and others; who returned a Bill for restoring Sir Charles Stanley in Blood, which their Lordships sent down with some Amendments; to which the House of Commons do agree. Hodie 1a vice lecta est Billa, "An Act for regulating the Measures and Prices of Coals." The Lord Chamberlain reported, "That his Lordship hath acquainted the King with the Desire of both Houses to attend His Majesty with an Address; and His Majesty hath appointed the Time to be this Evening, if it may be done conveniently; otherwise To-morrow." To let them know, His Majesty hath appointed the Select Committee of both Houses to attend Him this Evening, to present the Address to Him for the General Fast; and that the Committee of this House is ready to go to the King presently. Hodie 2a vice lecta est Billa, "An Act for setting the Measures and Prices of Coals." ORDERED, That the Consideration of this Bill is committed to the same Committee as the Bill concerning Jurors is. That the Committee of the Commons are ready to go with the Lords Committees, to wait on the King, when their Lordships please. A Message was brought from the House of Commons, by Sir Solomon Swale and others; who desire a Conference, upon the Bill to prevent Delays in extending Statutes, Judgements, and Recognizances. That this House will give a Conference, as is desired; and appoints the Time to be presently, in the Painted Chamber. "That the House of Commons agree to all the Amendments made by their Lordships to the Bill concerning Statutes, Judgements, and Recognizances, except to the Proviso concerning the Lord Hunsdon; and their Reasons are, because they know not whether there were such a Statute as the Proviso mentions, nor whether the Lord Hunsdon were enabled to extend it; if he be, the Commons conceive that this Bill doth not prejudice him, if he have a Right. And the Commons say, That if they allow of One Proviso of that Nature, they cannot tell how to deny all of the like Nature; therefore could not consent to this." The Question being put, "Whether this House shall agree with the House of Commons in the Matter of this Report?" To let them know, this House agrees with them to leave out the Proviso concerning the Lord Hunsdon, in the Bill for Statutes, Judgements, and Recognizances. ORDERED, That the Earl of Pembrooke is added to the Committee for the Bill concerning Sutton Marsh. The House took into Consideration the Bill for the Relief of poor Prisoners. And, after a long Debate, no Resolution was made therein. ORDERED, That the Committee for the Bill concerning regulating the Measures and Prices of Coals do meet as soon as the House rises. Dominus Custos Privati Sigilli declaravit præsens Parliamentum continuandum esse usque in diem Jovis, secundum diem instantis Martii, hora decima Aurora, Dominis sic decernentibus.